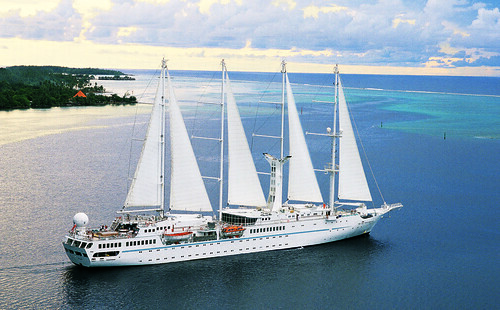 Sail Papeete roundtrip departing 31 October 2014 for 7 nights onboard Wind Spirit. Book now and save $646 per person. Fares start from $3,073 per person twin share. Wind Spirit is the perfect way to experience the true wonder of Tahiti; on land, at anchor, and in magical underwater wonderlands. Sailing under full sail whenever possible, guests will voyage from one legendary island to another. The yacht will anchor overnight at most islands in order to give guests time to savour the crystal-clear lagoons, lush rainforests and the local culture. There will also be plenty of time for one or two-tank certified dives, beginning SCUBA exploration, and amazing snorkelling. In Bora Bora, Tahitian fire dancers brighten the night as guests celebrate a traditional Ahima'a feast at their private island celebration event. Windstar Cruises operates a fleet of small luxury cruise ships known for its intimate yacht style experience and unique voyages to the world’s best small ports and hidden harbours. Its three recently renovated sailing yachts carry just 148 to 310 guests and cruise to 50 nations, calling at 150 ports throughout Europe, the South Pacific, the Caribbean, and Central America. In May of 2014, Windstar will launch Star Pride, followed by Star Breeze and Star Legend in May of 2015. The power yachts, with a capacity of 212 guests each, will double the size of Windstar’s fleet, making the company the market leader in small ship cruising with 300 or fewer passengers, with a total of 1,242 berths. The additional capacity will open up new itineraries such as voyages to Southeast Asia, Arabia, Iceland, and beyond. Windstar was recently listed on Condé Nast Traveller’s prestigious Gold List, coming in as the #3 cruise line in the world.